If your travels find you in the charming seaside community of Del Mar, California, some twenty miles north of downtown San Diego, celebrate your good fortune. Not only will you be afforded majestic views of the California coast and the pleasure of meandering through the quaint and picturesque town of Del Mar, you are in the perfect location to enjoy a culinary experience at KITCHEN 1540, located in the historic seaside hotel, L'Auberge Del Mar. The brainchild behind the taste sensations on the restaurant's new menu is Chef Brandon Fortune. Classically trained at the Le Cordon Bleu College of Culinary Arts in Atlanta, Brandon's creations are modern American with a decidedly Southern influence based on his Southeastern roots. KITCHEN 1540's sleek, modern décor is sophisticated and comfortable at the same time, and sets a perfect stage for a variety of innovative dishes sure to please the most discriminating palate. So what can diners expect from Fortune's menu? Start off your culinary adventure with a tastefully arranged platter of cold-smoked trout and organic beets. Cured steelhead saltwater trout and tender beets are embellished with a blood orange vinaigrette, black walnuts, and feathered horseradish, served with a side of chive-potato cakes. Those who prefer a warm appetizer might elect a plate of asparagus and grilled wild ramps. Described by the chef as “spring on a plate,” this vegetarian dish features organic wild ramps and asparagus with parmesan and pecorino cheeses shaved on top. A delightful French-inspired cream sauce made with eggs and lemon and lightly toasted caraway seeds is the perfect dressing for this vegetable creation. Seafood specialties include the popular “still smoking scallops,” presented sizzling hot surrounded by asparagus and coriander puree, wild chanterelles, and smoked almonds powdered with lemon-thyme buds. The flaky North Pacific Halibut is served with celery root puree, mushrooms, spring carrots, and garnished with crispy fiddlehead ferns. Chocolate lovers will delight in the malted milk chocolate mousse, one of several excellent desserts available to satisfy your sweet tooth. Roasted almonds and chocolate crunch, topped with homemade coffee ice cream, provides a decadently delicious end to a perfect meal. 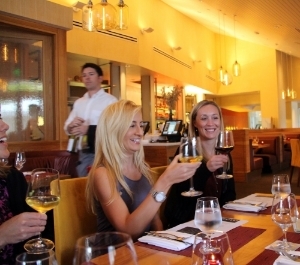 For a complete menu, visit www.laubergedelmar.com. For several of my images of Kitchen 1540 and Chef Fortune's culinary masterpieces, log onto the San Diego Scenic Photos site. Try it out if you are in Del Mar-- and raise a glass to your good fortune.